Petersfield Cemetery was established in 1857 to replace that at St Peter�s Church. The earliest burials are concentrated around the two memorial chapels near the entrance, on rather uneven land. 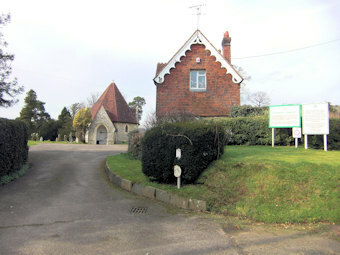 The cemetery is in the care of East Hampshire District Council. This is a medium size non-denominational cemetery, which has been extended into adjacent fields after the original area itself was filled. There have been about 7600 burials at the site with perhaps two thousand gravestones still visible in total. As there are no gates and the cemetery is approached by a long and secluded avenue of lime trees, there has been some vandalism over the years, with headstones broken and pushed over, particularly in the area near the chapels. The cemetery is still in active use, but is now approaching capacity and a new site is being researched for acquisition by the council. This set of gravestones are from the area at the far right of the cemetery, as seen from the entrance, running down alongside the housing boundary down to the railway line. Most memorials date from the period 1970-1989. The GPR holds 413 grave and 706 person records for the cemetery.